It’s both eerie and disturbing to realize that a friend has faded off into a void, and you’re not sure what happened — or when it happened. Ed lived out of a camper van in the back hills of Carmel Valley so he only came into Monterey once or twice a week. Sometimes I didn’t cross paths with him for weeks at a time, and if one of us was traveling then it might be a couple of months. Usually I ran into him at the library downtown, often spotting his van and barking dogs before I saw him. I first met Ed in 2005. He had a couple of black and white speckled Australian cattle dogs, ‘blue heelers’, and I had my two ‘red heelers’, Dingo and Panga. Often we had our dogs out exploring the library parking lot at the same time. Naturally, we started chatting about the dogs, which led to ongoing discussions covering politics, music, nature, and life. In the Army, he became a helicopter pilot and flew scouting and reconnaissance missions. Often the mission, he said, was to draw fire and then get the hell out without getting shot down. 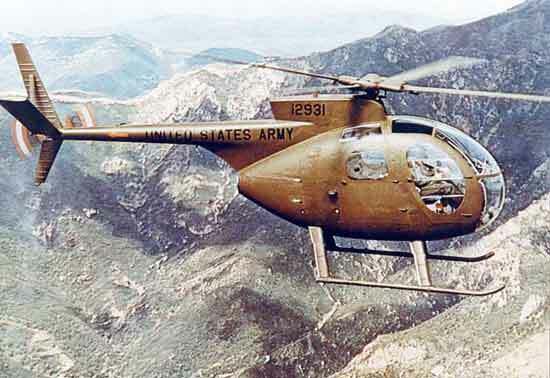 Helicopters served many different roles in Vietnam, and the Hughes OH-6 Cayuse helicopter was primarily used as a scout. Ed also learned to repair helicopters while in the Army. At some point, however, he became disenchanted with a career in the military. His political understanding of the Vietnam War shifted radically. After he left the Army, he continued repairing and piloting helicopters as a civilian for a time. Ed’s photos were amazing. 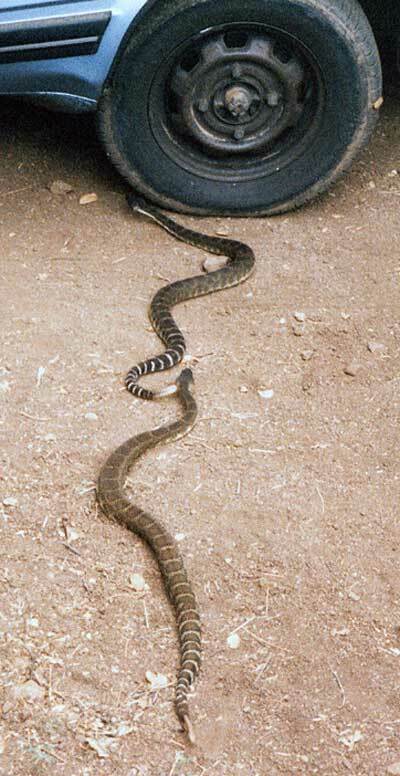 They showed aggressive stalking that culminated in a combat dance between two male Northern Pacific Rattlesnakes (Crotalus oreganus oreganus). Although Ed did not see her, most likely a female rattlesnake was close by. 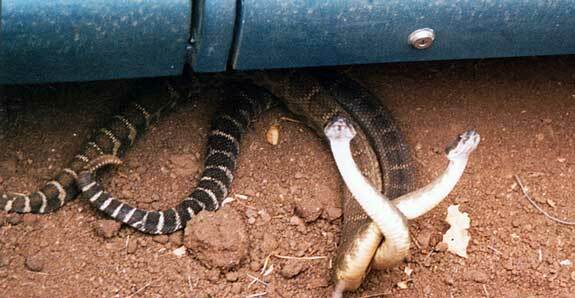 Although I have encountered many rattlesnakes in the wild on hikes and bike trips, I have never seen a combat dance. I scanned his prints so I could post them online. When I met Ed, he had journeyed a long road from that young super patriot who was ready to kill and die for the USA. He was adamantly opposed to the U.S. invasion of Iraq, as well as the entire American military empire that stretched across the globe. Ed linked the genocide of Native Americans in the 19th century to the destruction of Vietnam in the 20th century, and to the ‘Shock & Awe’ invasion of Iraq in the 21st century. Every era targeted a new enemy. In the latest colonial war to establish American hegemony over the planet, hundreds of thousand Iraqis were slaughtered and millions displaced. Ed was certainly not afraid to consider radical critiques of American politics and militarism. He attended a lecture by Ward Churchill, a professor whose outspoken political views eventually got him fired. We often discussed politics and economics, and exchanged a range of books and CDs. I passed along books by Mike Davis and Michael Parenti to Ed, for example, and he loaned me an audio CD of Cornel West, an intellectual he greatly admired. Our discussions and book sharing went on for over seven years. In September 2006, I assisted the Buffalo Field Campaign in setting up a couple of events in northern California. After organizing crews to protect the buffalo of the Yellowstone Park region throughout the winter and spring, the group traveled during the summer to raise public awareness. We set up one event at the Stockton Peace Center (yes, they have one!) and a second at the Monterey Senior Center. The Stockton turnout was bleak, but in Monterey about twenty-five people attended the presentation. I encouraged Ed to attend and he was enthusiastic. He arrived early and stayed for the entire event. I set up my video camera to record the presentation. Mike Mease talked about the threats to the buffalo, the group showed a DVD of park rangers and livestock officials harassing mothers and calves, and Good Shield Aguilar provided live music. Afterwards, Ed gave a donation and bought a Buffalo Field Campaign t-shirt. Later, I used some of the footage from Good Shield’s musical performance and edited it together with video I had shot of the buffaloes in Yellowstone. Ed was fond of my ‘red heeler’ cattle dogs, Dingo and Panga, despite the occasional flareup with his dogs. Generally, it was confined to a bit of growling and raised hackles. The dogs got along reasonably on a couple of hikes — including a tour of his property in Carmel Valley. 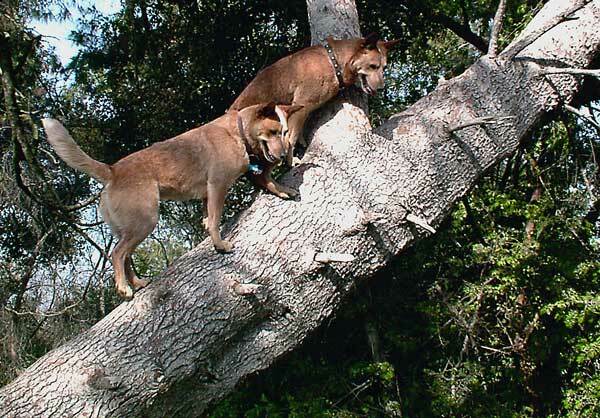 When Dingo came down with cancer (hemangiosarcoma) in late 2007, Ed was deeply sympathetic. He actually presented me with $500 to help pay for Dingo’s spleen cancer surgery. In 2009, I tried to pay him back for the loan and he refused to take it, insisting with a grin that he had given it to Dingo. Ed sold his property–just before the real estate crash in 2007 — so he had savings. However, $500 was a huge chunk of money to contribute to my dog’s vet bill, and an amazing testimony to Ed’s character, generosity, and love of animals. 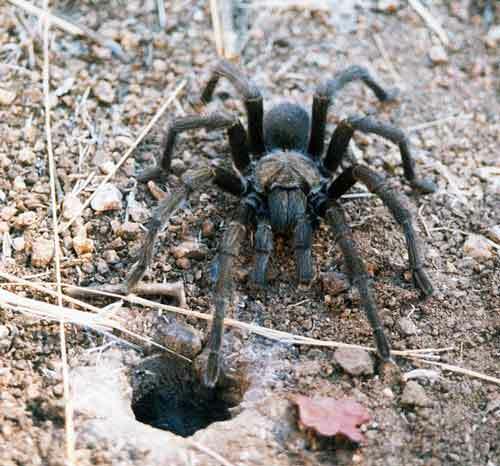 After Ed sold his property in Carmel Valley, he continued to live and camp on an adjoining property that was unoccupied. (Hey, sometimes you can “have your cake and eat, too”.) Although Ed was not a ‘loner’, he certainly seemed comfortable with his solitude out on the ranch. Then Ed began to prepare for an epic one-way journey to Latin America. 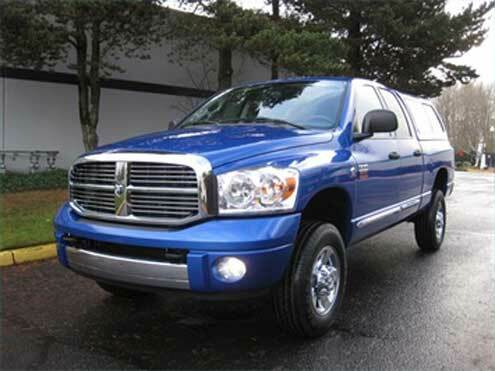 He bought a 2007 electric blue GMC truck with a Cummins diesel engine, and mounted a camper on the back. Surprisingly, Ed spent the next couple of years rebuilding his new vehicle to make it even more trip worthy. As a competent mechanic who had repaired helicopters for a living, Ed set to work to improve his truck for jungle and off road conditions. Everything from the wiring to bumpers and shocks were removed and improved. New alternators, compressors, and lights went in. A solar panel was added. I feared the truck would be a target for theft once Ed passed south into Mexico, but he had a plan for every contingency. He installed a ‘kill’ switch so the truck would stall & die after a few hundred meters if it was stolen. These mechanical improvements were taking years to implement, pushing back Ed’s departure date for Latin America. He vowed never to return to the U.S. once he got down there, but was he ever really going to leave? 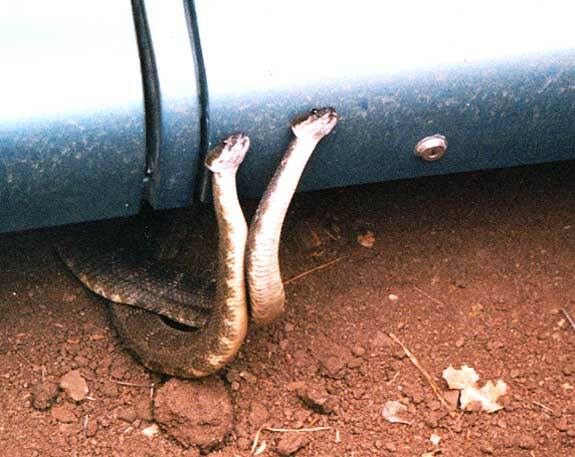 Some of his friends wondered if the endless mechanical tinkering was not really a secret program to stay in California. After all, why did he have to leave? In the meantime though, Ed did research on roads, towns, and terrain in Central and South America. We chatted about getting his truck from Panama to Columbia through the virtually impassable Darien Gap. He delved into shamanism and the legendary psychoactive drug ayahuasca, reading William S. Burroughs’ famous account. On our last encounters, I helped him select a Nikon camera and an Apple Macbook Pro for his journey. I encouraged him to post a blog once he was on his journey, and upload all his photos to Flickr. Ed had many friends around the area. Most were bohemian, counter-cultural types or people interested in politics and art. One of the Monterey librarians, Victor Henry, knew Ed very well. Victor is also a Vietnam War vet (he was drafted) whose political understanding has evolved over the decades. He writes poetry, some of it related to his experiences in Vietnam. Victor often talked with Ed at the library, chatting about books and shared interests. Victor is not sure when he saw Ed last, and we have discussed Ed’s disappearance numerous times. For awhile, I asked everyone associated with Ed if they had seen him or heard from him. No one had. Recently, in September 2014, a friend of his named Paul approached me in the library and asked me if I knew where Ed had gone. The encounter ended with us both shaking our heads blankly, mystified. My best guess is that Ed disappeared from Monterey in 2012. Was he ill? I wondered if he had died suddenly from a heart attack or gotten seriously injured. Had someone killed him for his valuable truck? Violent scenarios flitted through my imagination. Had he simply left the country without saying goodbye to any of his friends? Ed was a huge fan of Lila Downs –always promoting her music and loaning CDs to friends. Victor accompanied him to one of her concerts in Santa Cruz — probably in 2011. When Lila Downs was on tour again about a year later, we both felt compelled to let Ed know. And that’s when we realized that he was gone. It occurred to me that I had never taken a photo of Ed or his dogs. I started searching the internet, looking for information: an obituary, a police report, some photos, a reference or recollection. Ed Ashworth, however, is a common name, and I turned up nothing that related to him. 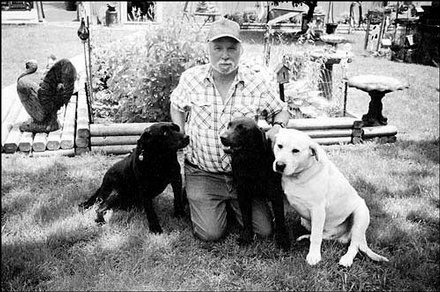 Strangely, I found a nice photo of Ed Ashworth on the internet posing with his three dogs…but it was the wrong Ed. Three dogs and Ed — but the wrong Ed. Where are Ed’s dogs I often wonder? Are they with him somewhere in Venezuela? Are they yelping it up merrily in Peru? Are they safe? Sometimes I think I see him on the road — and I have to look again. But it’s never him. I keep hoping he’ll pop up or a post card will arrive at the library. Victor will hold up the post card with a knowing smile, and the mystery will be solved. The email address I have for him doesn’t work. Messages bounce back undelivered. Around 2008, Ed got himself an 800 number with voicemail. Six years later… that number still works. Ed’s voice says, “Greetings. Leave me a message and I’ll get right back to you.” It’s a little chilling. I can almost hear Rod Serling and that eerie music in the background. I leave a message on Ed’s service every few months. I talk about Monterey and some of his friends. He doesn’t get back to me. It’s only a few dollars a month to rent an 800 number for voicemail– did Ed pay for his years in advance? That would be like Ed. Does he ever listen to those messages? Does anyone ever listen to them? Ed, if you are out there, phone home. Australian cattle dogs, Ed Ashworth, Guatemala, Latin America, Lila Downs, Victor Henry. Bookmark.